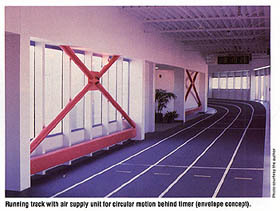 An innovative energy system integrates current technologies to efficiently service a fitness center. An integrated mechanical/electrical system using several current technologies is efficiently serving the new two story, 48,000 sq. 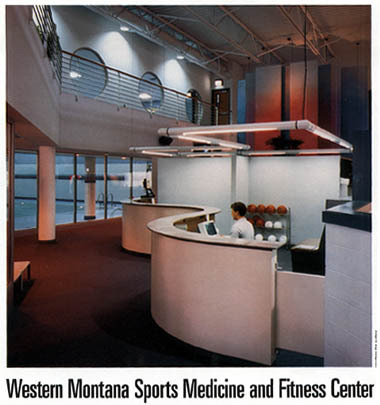 ft. Western Montana Fitness Center in Missoula, Montana. Track temperatures are maintained in a deadband from 65 degrees in winter, to 78 degrees in summer. The fans run continously during the day mode. At night, the DDC cycles all six fans simultaneously to take advantage of the "envelope" concept. the DDC returns the track to normal day temperatures using an optimal start warmup program. 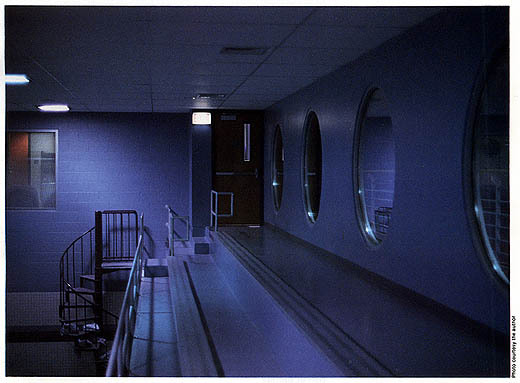 Cooler Gallery above pool for spectators.